Fall is the time for savory comfort food style casseroles with full bodied flavor. This hearty Whole30 Shepherd’s Pie is a gluten free and Paleo version of the traditional English casserole. My husband is English and loves it when I make Shepherd’s Pie. 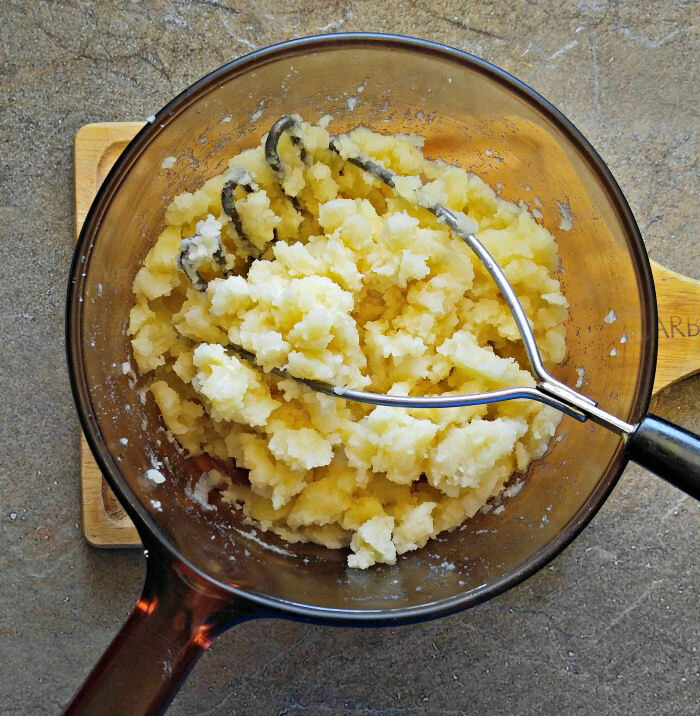 But the normal dish uses mashed potatoes with butter and cream, as well as flour to thicken it. Just a few easy substitutes gives me the gluten free and Whole30 version of the dish without sacrificing any of the flavor. 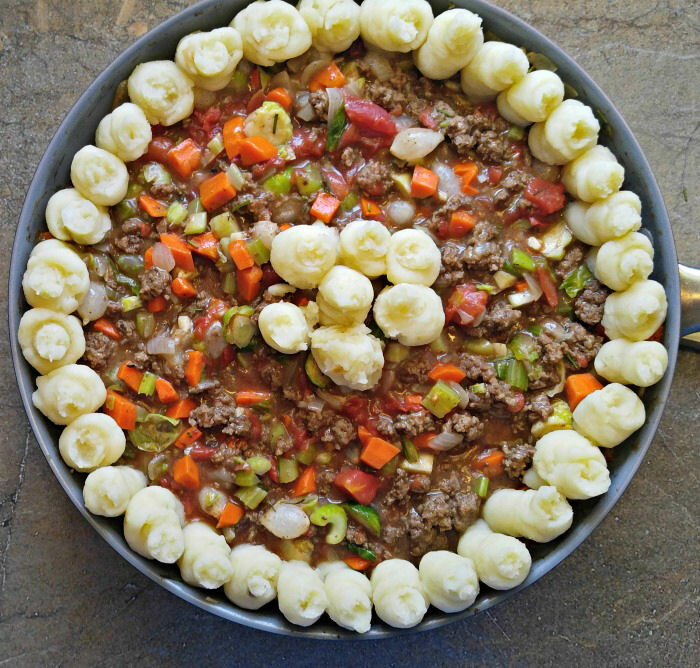 Making this Whole30 Shepherd’s Pie. Instead of using peas in my Shepherd’s pie, (Whole30 does not allow legumes of any kind.) I chose to use chopped Brussels sprouts. 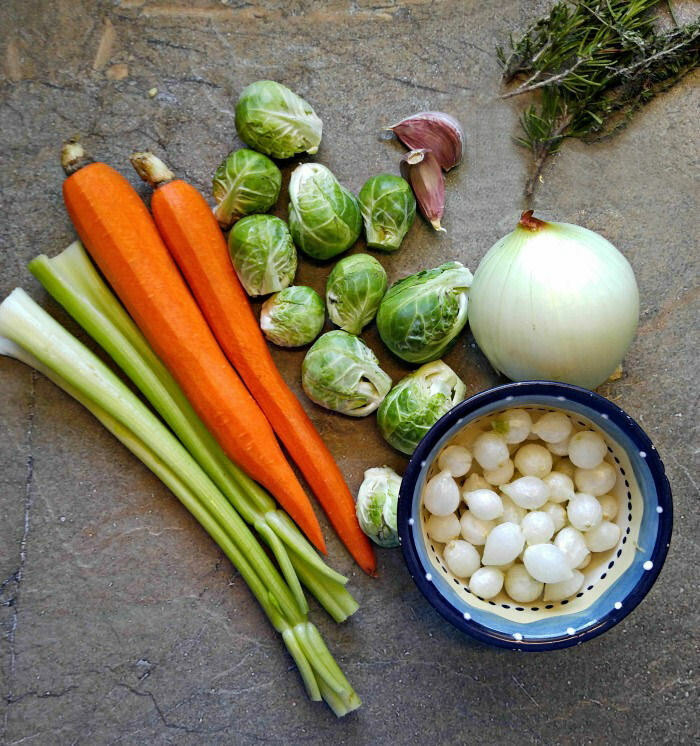 Carrots, celery and frozen baby onions along with yellow onions and garlic round out the vegetables and fresh herbs that give this dish so much flavor. 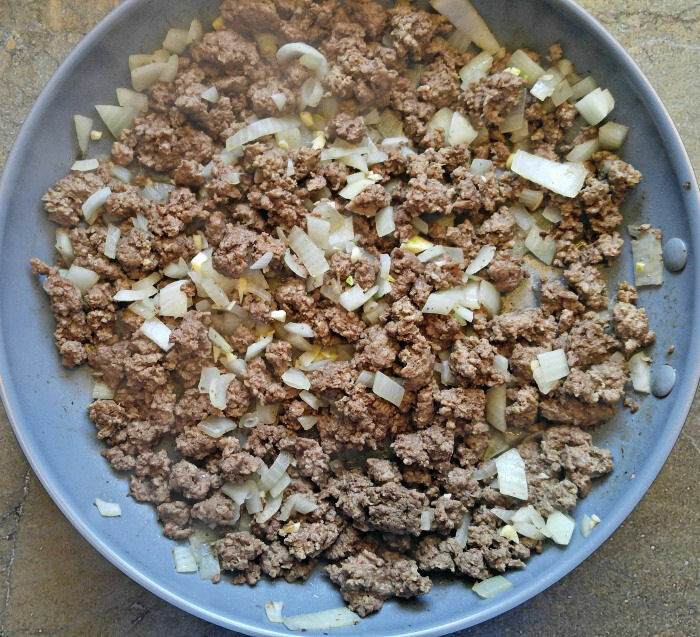 While the potatoes are cooking, brown your beef in a large oven proof skillet, making sure to break the beef into small pieces, with some chopped onions and minced garlic. 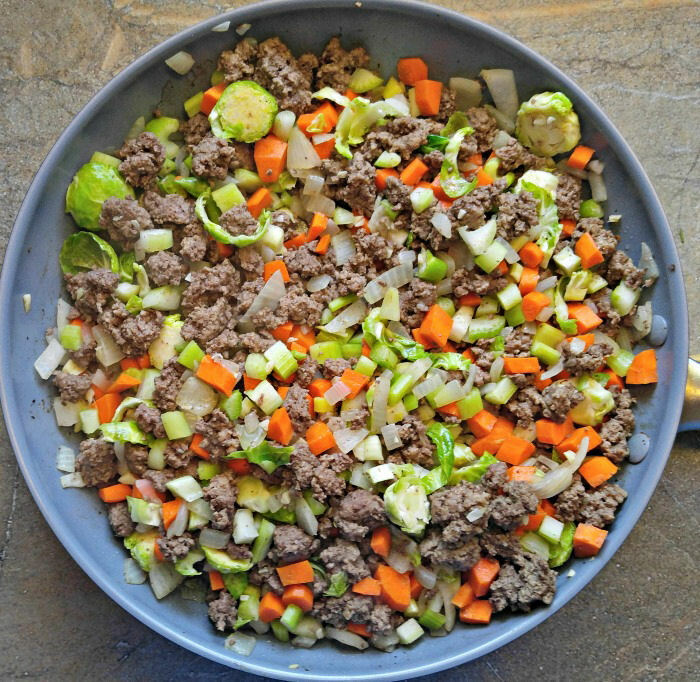 When the beef starts to brown, add the carrots, celery and chopped Brussels sprouts and cook until the veggies are starting to get tender, about 10 minutes. 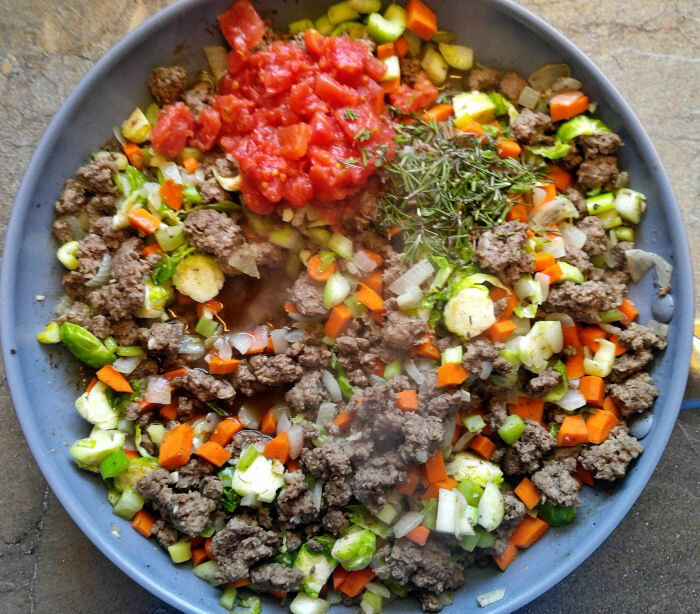 Now is the time to stir in the canned tomatoes, (Check your label to make sure there is no sugar) as well as the fresh herbs, salt and pepper and 3 1/2 cups of beef broth. Continue cooking for about 20 minutes. The frozen baby onions go in last so they won’t get too soft during cooking. The sauce gets thickened with 1/2 cup of beef broth and the tapioca flour to make a silky and smooth gravy. I couldn’t help myself…I had to taste it at this stage. SO GOOD! I used a piping bag to pipe mounds of mashed potatoes around the edge of the casserole and also in the middle. If you have a lot of mashed potatoes, you can cover the whole top, but I wanted to keep the starch level in check, so I didn’t cover it all. Still looks pretty though, don’t you think? 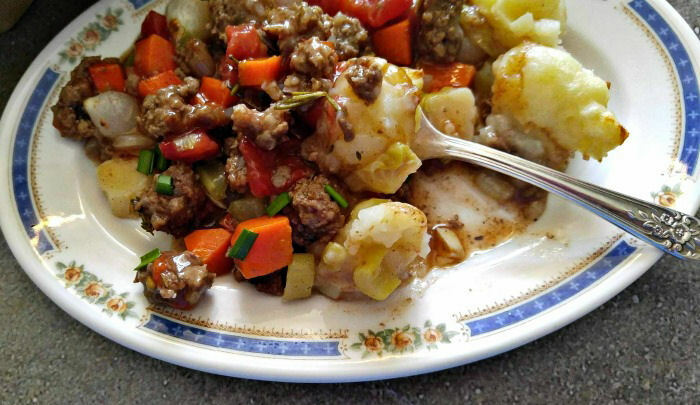 Place the saucepan in a preheated oven and bake for about 25 minutes until the sauce is bubbly and the potatoes are just starting to brown on top. Garnish with a few fresh chopped chives and serve hot. 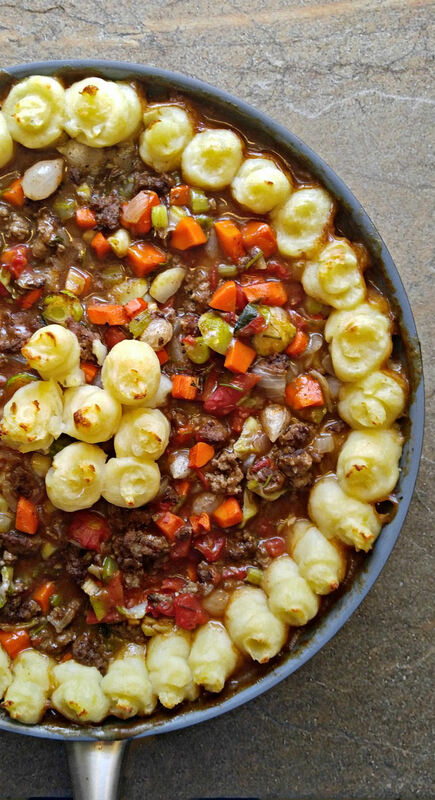 This delightful Shepherd’s Pie is tasty and hearty. The sauce is silky smooth and the vegetables add a robust flavor that can’t be beat. It is sure to become a family favorite. It’s easy to stick to a Gluten free diet plan with just a few substitutes. This recipe proves that you won’t sacrifice on flavor in the slightest. 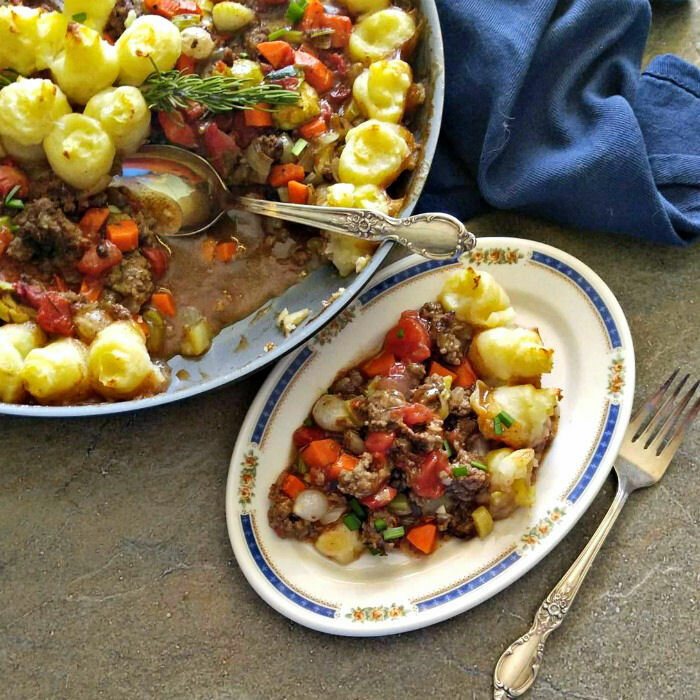 For another great tasting Whole30 beef recipe, check out my Easy Beef Goulash. It’s made in one pot and tastes amazing. 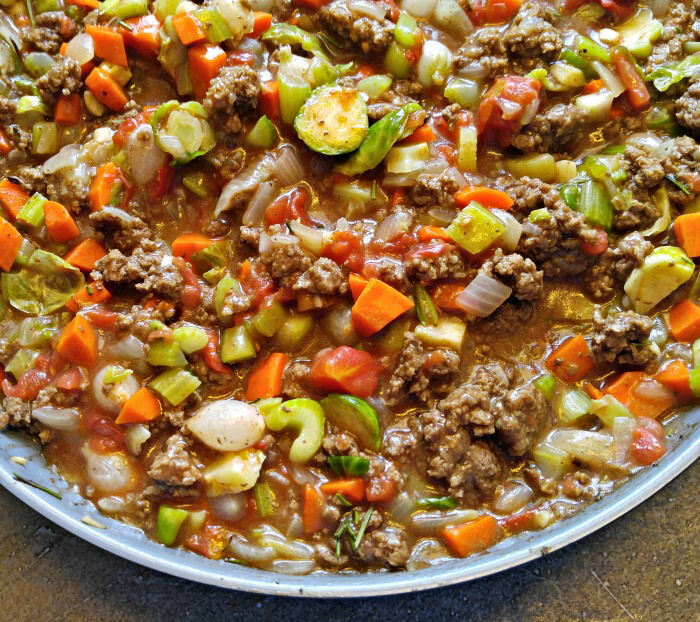 This hearty Shepherd's pie is full of flavor and fits into a gluten free, paleo and Whole30 diet plan. In a large, oven proof skillet saute the ground beef over medium high heat for about 5 minutes, breaking it into small pieces. 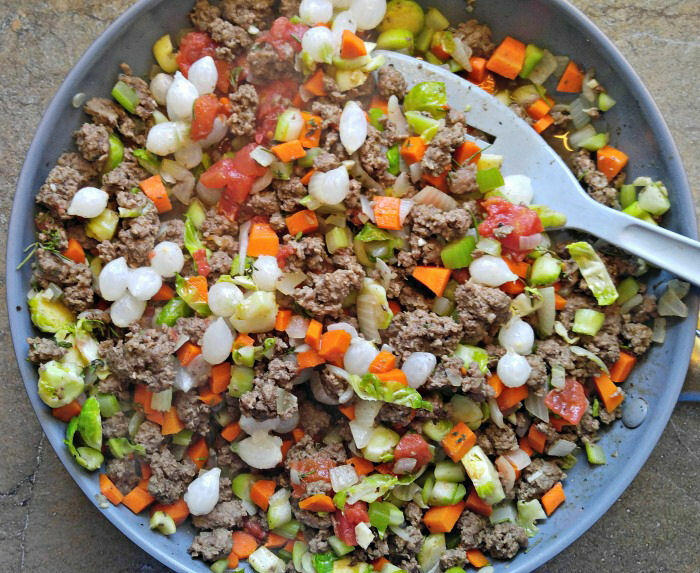 Add the chopped onions, minced garlic, chopped Brussels sprouts, carrots and celery and keep cooking for another 10 minutes. Mix in the sea salt, cracked black pepper, canned tomatoes, fresh herbs and 3 1/2 cups of beef broth. Stir, then reduce heat to medium and cook for 20 minutes. Add the frozen baby onions an stir. Meanwhile, in a small glass, whisk the tapioca flour with the remaining 1/2 cup of beef broth. Add this mixture to the pan, stir and cook for about 3 minutes, until the sauce starts to thicken. Sounds great, Can’t wait to try it !! !.